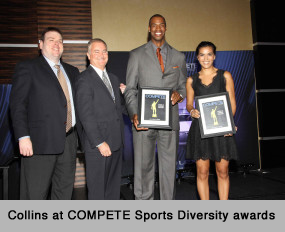 Jason Collins is now the first openly gay professional athlete playing in one of the four major U.S. team sports. The 12-year NBA veteran center originally signed only a 10-day contract with the Brooklyn Nets on February 23 but in the short time since that signing, he continues to show the world what a class act he is. He has since been signed for the rest of the season. Before coming out, Collins wore No. 98 on his jersey while playing for both the Celtics and Wizards as a tribute to Matthew Shepard, the Wyoming college student who was murdered in a 1998 gay hate crime. Collins is once again wearing No. 98 on his jersey, saying that wearing it on his jersey this time has meant a lot to him since it’s no longer a deep secret that he’s a gay man. “Obviously, it started off my friends and family knew why I chose that number,” said Collins, “and it’s just cool to see that so many people support it as evidenced by so many people buying the jersey.” This references the fact that his jersey has become a big seller on NBAStore.com, ranked as top seller three days in a row. And the NBA announced plans to donate sales proceeds of his jersey to the Matthew Shepard Foundation and the Gay, Lesbian & Straight Education Network’s Trevor Project. In fact, the league said that donations will be no less than $100,000 and that they’ll also auction off Collins’ autographed jerseys worn during games to benefit the same two organizations that work to prevent youth suicide within the LGBTQ community. 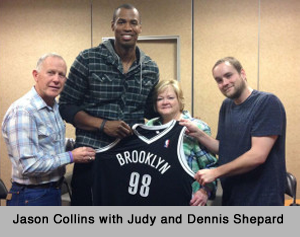 After the Nets trounced the Denver Nuggets 112-89, Collins met with Shepard’s parents, Judy and Dennis, and brother, Logan. Calling it “one of those cool treats in life,” he presented them with a signed black and white Nets jersey bearing his name and the No. 98. Although it wasn’t a jersey he wore during the game, Collins said he didn’t want to give them a sweaty one. The No. 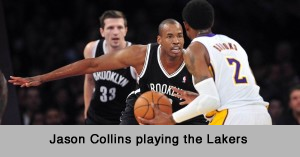 98 jersey wasn’t ready for his first game with the Nets against the Lakers on Sunday so Collins wore one with No. 46 and his name quickly added. But it was ready for the Wednesday night game against the Blazers and the Nuggets game the next night. With twin Jarron (also an NBA player) in the stands for his brother’s first game, it was Jason’s first time on the court since April 17and his first time wearing a Nets jersey since 2008. While he helped with two rebounds and a steal, he missed his only shot and committed five personal fouls and two turnovers. But his hacking skills speak more to his defensive focus as a player than to his time off the court. Nets coach Jason Kidd, good friend and former teammate of the 7-foot Collins, signed him to bring size and experience to the team’s front line, like setting screens, blocking out, rebounding and committing hard fouls. In his first four games Collins racked up three points and four rebounds in 8.5 minutes per game and experienced warm ovations from the crowds at each game. While many try to compare him to Jackie Robinson’s breaking the color barrier in baseball, the humble Collins says he’s just trying to be Jason Collins. And I believe that his natural humility is what makes his coming out and his continuing activism to eliminate homophobia in sports more special than him simply being remembered as the first openly gay player in one of the four U.S. major team sports. At age 35, it was his driving need to finally be open and honest about who he is as a human being that eventually led to him coming out – it had nothing to do with a need for media attention or a desire to go down in history as the man who did for basketball what Jackie Robinson did for baseball. Collins is a respected team player – his 12 years in the league are a testament to his ability to play the game of basketball at a professional level. But the good news for all LGBTQ athletes is that he’s willing to speak out on their behalf. He represents the very best in a professional athlete who just happens to be gay rather than a gay athlete who just happens to be a professional basketball player. And that last statement about making people laugh is so typical of the fearless yet easy-going Jason Collins. Since Jason’s coming out, Jarron has been there to support his twin all the way, becoming a true ally to the LGBTQ community in the process. It is for their bravery both on and off the court as well as their commitment to each other, to their shared sport and to the gay community that we honored both men with our 2013 Legacy Award at the Compete Sports Diversity Awards in Los Angeles this past November. It’s also important to note that beyond their recent donations to the Matthew Shepard Foundation and the Trevor Project, the NBA has been internally supportive of diversity from the top-down, treating Collins the same as any other player when speculation was raised over the possibility that he remained unsigned because he was gay. Both former NBA commissioner David Stern and current commissioner Adam Silver investigated the allegations and were satisfied that the charge wasn’t true, a finding that both Collins and his agent Arn Tellem agreed with. So as we circle back to Collins’ current on-court play with the Nets, where the game of basketball ultimately hinges on money decisions made every day, the team is happy with his performance. He was signed to a second 10-day contract and finally he signed with the team for the season after the second 10-day contract expired. For all those who have insisted that a gay professional player on one of the four major U.S. team sports would be a team distraction and have a negative impact on the game, knock it off! Quit coming up with the “doomsday” scenarios you think will happen if, for example, Michael Sam is drafted by the NFL. Quit saying that the NFL just isn’t ready for a gay player. Instead, take a good look at other professional sports with openly gay players on the team. Really look at … and acknowledge … how well they’ve all handled the transition. What is it about the four major U.S. team sports that you think makes them different than say, tennis, boxing, bowling, rugby, swimming, soccer and the many other sports where gay athletes have already taken their rightful and equal place next to their straight teammates? In fact, have you watched any of the NFL videos by retired players talking about their gay teammates that stretch back years? While they knew they had a gay teammate, in each case they also knew he was a professional who worked as hard as everyone else to win the game. It’s time for everyone to move forward! While I’m personally thrilled for him to stay with the Nets for the season, nevertheless, if Jason Collins played for 10 days, 10 months or 10 years, the end result is the still the same – he has elevated the conversation about what it means to be an openly gay professional athlete and we should all thank him for his personal courage, commitment and integrity!